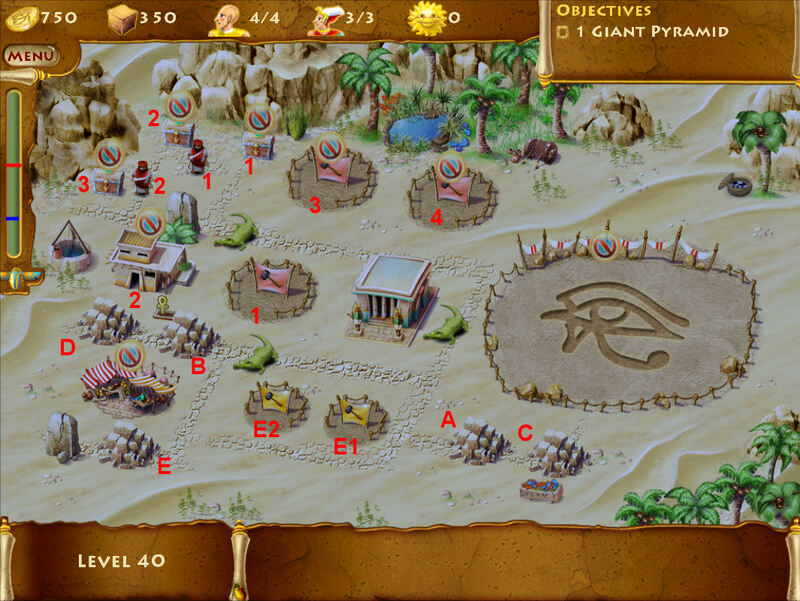 This is a “walkthrough” for The Timebuilders: Pyramid Rising game. I documented how I finished each level along with help from the BigFish forums as needed. Even though most of the levels are in the forum, you have to search for each one separately so figured I’d consolidate them into one location. If I got help from the forums, I added thanks to the user who posted the steps. I didn’t actually use any of the help from the forums until after level 18 but figured these folks worked hard to help others so they deserve some credit. Note: Please make sure you have the version downloaded after 3/5/11. 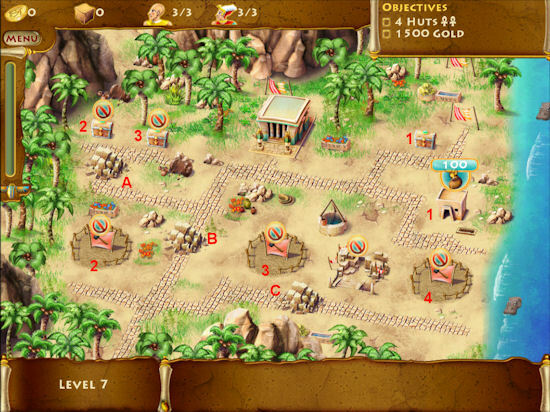 Each lot, rockpile, treasure chest, nomad, etc., is numbered in the images and the steps match up with the numbered items. Houses are numbered based on their Lot number, not on how many are being built. 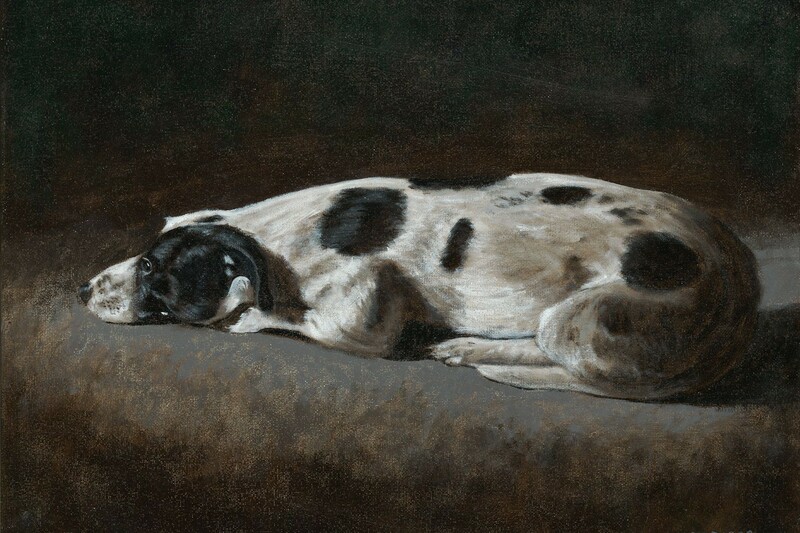 Click on the images to view a larger version. Even with the provided help, this level is very easy to complete. You already have two huts built, so immediately send three workers out to build three more huts and as soon as the first hut is complete, send a worker to build the last hut. While they are building, collect rent then continue to do so until you get 1500 gold. 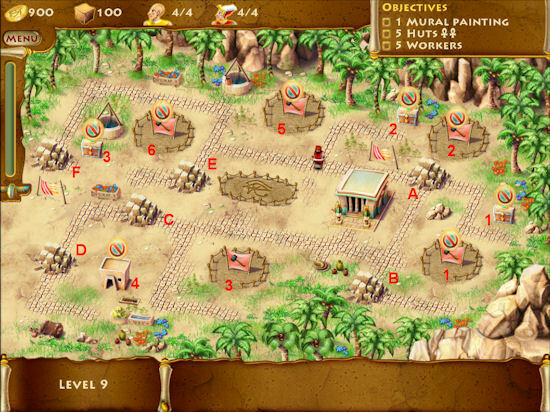 Clear rockpiles A & B and build a hut on Lot 1. 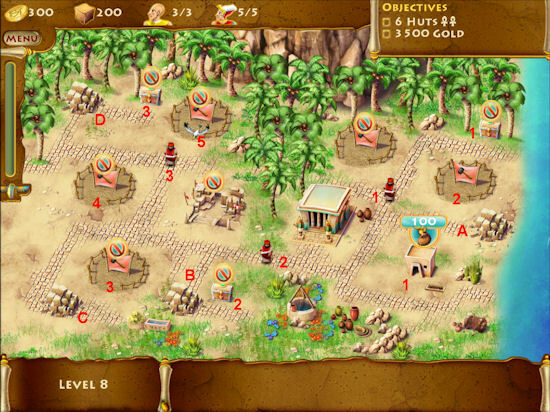 Clear rockpiles E & F and build a hut on Lot 3. Clear rockpiles G & H and build huts on Lots 4 & 5. Build a hut on Lot 6. Continue collecting rent until you get 2000 gold. Level 3 has you upgrading your huts for an increase in rent. Upgrade huts as soon as they are built for maximum rental collection. Try not to let the workers move away from the hut once they have completed the initial build. Upgrade hut 1 and collect rent on hut 2. Clear rockpiles A & B and upgrade hut 2. Clear rockpiles C & D and build huts on Lots 3 & 4. Upgrade huts 3 & 4. Build hut on Lot 5 and upgrade. Continue collecting rent until you get 1500 gold. Level 4 has you building and upgrading 7 huts. Remember to keep an eye on the workers building the huts. Once they finish, they’ll stay at the building for a few seconds giving you a chance to have them upgrade the hut or assignt them a new task. The further they get away from where you want them next, the longer it takes for them to get back there. Clear rockpiles A & B, build hut on Lot 1 and upgrade. Clear rockpiles C & D, build huts on Lots 2 & 3 and upgrade. Clear rockpiles E & F, build huts on Lots 4 & 5 and upgrade. Build huts on Lots 6 & 7 and upgrade. 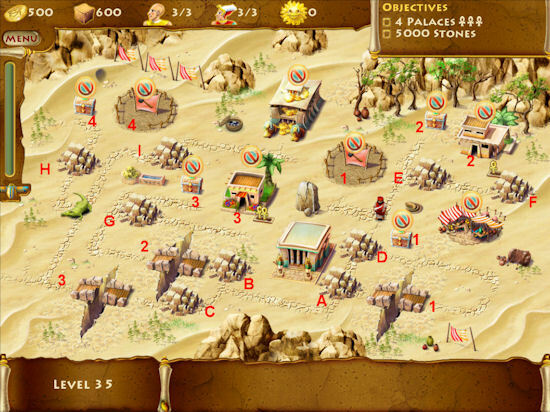 Level 5 has you build a quarry where you can get stone although you will need to supplement it with clearing rockpiles. Whenever possible, build your quarry as near to your shrine as possible so workers can get to it faster and bring back the stone faster as well. Build Quarry on Lot 1 and upgrade hut on Lot 2. Build huts on Lots 3 & 4. 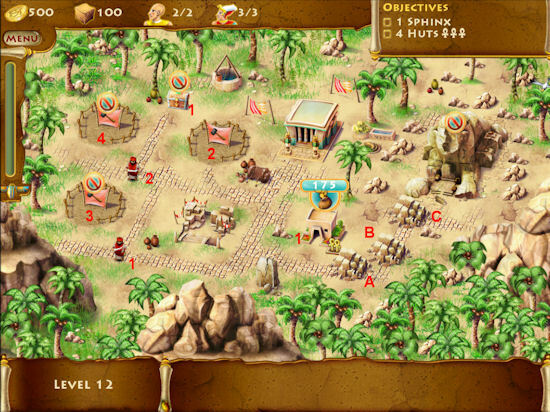 You’ll have 10 stone left which isn’t enough to build more huts or upgrade. Collect rent until you get 1000 gold. Build huts on Lots 4, 5, 6, & 7 and upgrade each as you go. You can now hire more workers and priests. Build hut on Lot 1 and upgrade. Build hut on Lot 2 and upgrade. Hire another worker and priest as you can (500 gold each). Clear rockpiles C & D.
Build huts on remaining lots as you can and upgrade. Continue collecting rent until you have 500 gold and hire your last priest. As soon as you have another 500 gold, hire your last worker. Huts can now be upgraded twice plus we have some treasure chests to open. Open chest 1 (75 stone) and clear rockpile A. Open chests 2 (50 stone) and 3 (300 gold). Clear rockpiles B & C.
Build huts on Lot 2 and upgrade twice. Build hut on Lot 3 and upgrade once. Collect rent until you have 1000 Gold then quarry 300 stone. Upgrade hut 3 once more. Build hut on Lot 4 and upgrade twice. Continue collecting rent until you have 1500 gold. In this level, we get to “support” the nomads by paying them to move out of the way. When paying off multiple nomads, check how much each wants first (the ones not blocked that is) and look at what is beyond them to determine which should be paid off first. For example, if you have houses you can build and one nomad blocks the bank and another blocks a building site, you might want to pay off the nomad blocking the bank first so you can save up gold faster. Pay off nomad 1 (300 gold). Upgrade hut 1 twice and clear rockpile A. 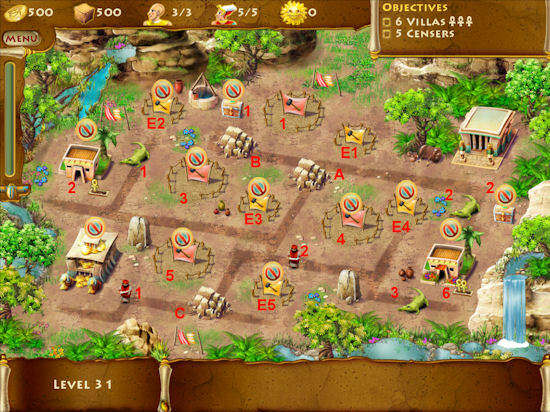 Build huts on Lots 2 & 3 and upgrade twice. Collect rent until you have 1500 gold and pay off nomad 2. Open treasure chest 2 (300 gold). Collect rent until you have 1000 gold and quarry 300 stone. 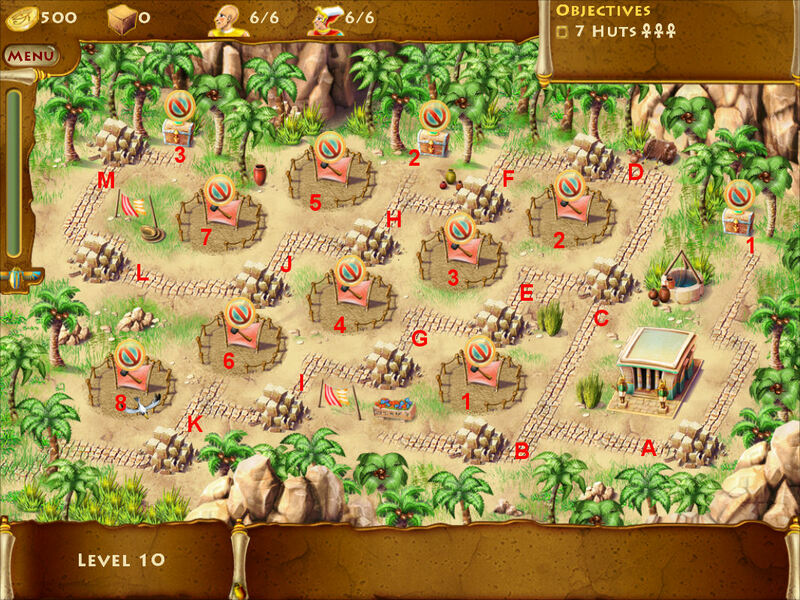 Build huts on Lots 3 & 4 and upgrade twice. Collect rent until you have 2000 gold and pay off nomad 3. Build hut on Lot 5 and upgrade twice. 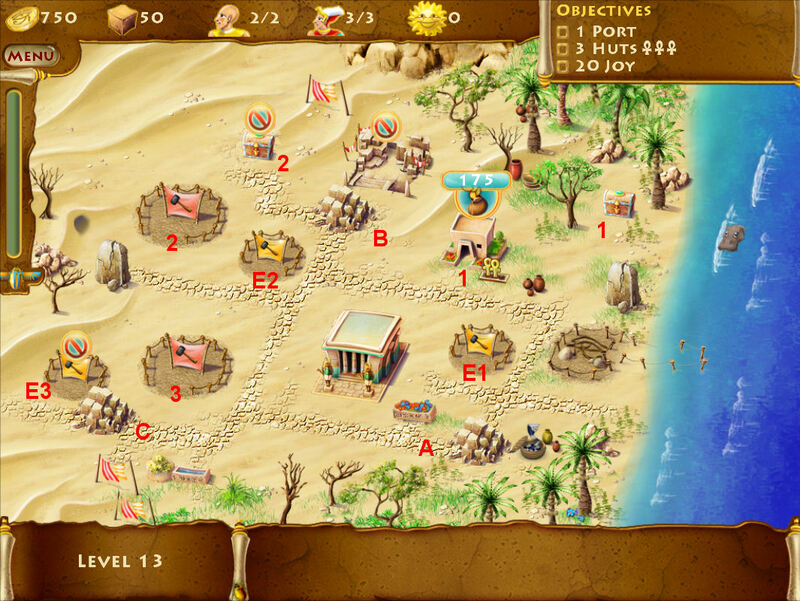 Open treasure chest 3 (1000 gold). Continue colllecting rent until you have 3500 gold. We get to build and paint a mural on this level. You can assign up to 4 workers to work on the mural at once. Clear rockpiles A & B. Open treasure chest 1 (100 stone). Clear rockpile C then D (this clears hut on Lot 4). Assign a worker to the mural. Build huts on Lots 2 & 3 – don’t upgrade yet. Collect rent until you have 1000 gold and pay off the nomad. Open treasure chest 2 (500 gold). Clear rockpile E then F.
Open treasure chest 3 (200 gold). Collect rent until you have 1000 gold and build a quarry on Lot 1. Assign a second worker to the mural if you want but you can make it with only 1 assigned. Build huts on Lots 5 & 6. Upgrade all huts a second time. Collect rent until you have 500 gold and hire your last worker. If your mural isn’t finished yet, assign more workers until there are 4 total working on it. I’ve been able to finish with 50 seconds left with only one worker and with 1:30 left with two workers. Level 10 adds a third upgrade to our huts, a garden top roof. 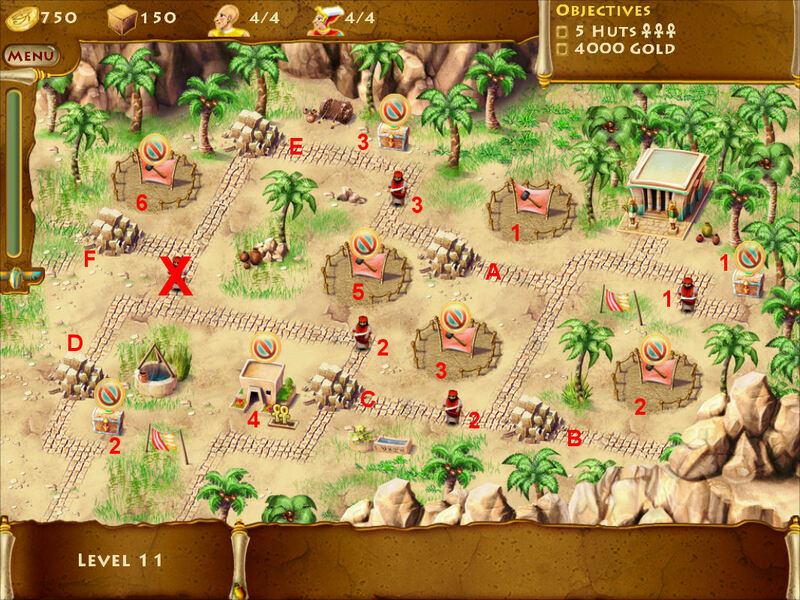 Clear rockpiles A, B, & C.
Open treasure chest 1 (500 gold). Build a quarry on Lot 1. Clear rockpiles D & E and build a hut on Lot 3. Clear rockpiles F & G then open treasure chest 2 (300 gold). Clear rockpiles H & I and build a hut on Lot 4. 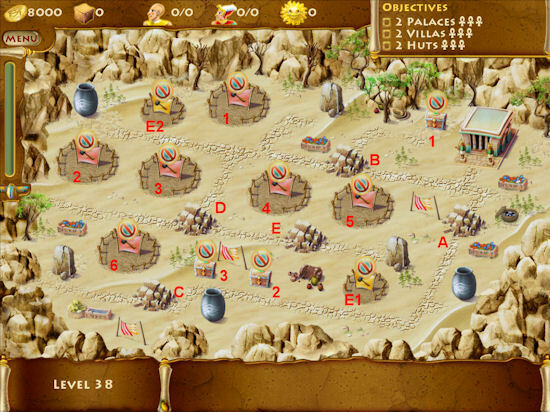 Clear rockpiles J & K and build huts on Lots 5 & 6. Clear rockpile M then open treasure chest 3 (500 gold). As soon as you have 1000 gold, quarry 300 stone. Start upgrading all huts three times. You shouldn’t need to quarry more stone. We have 5 nomads to pay off on this level so it’s starting to get a bit more complicated. 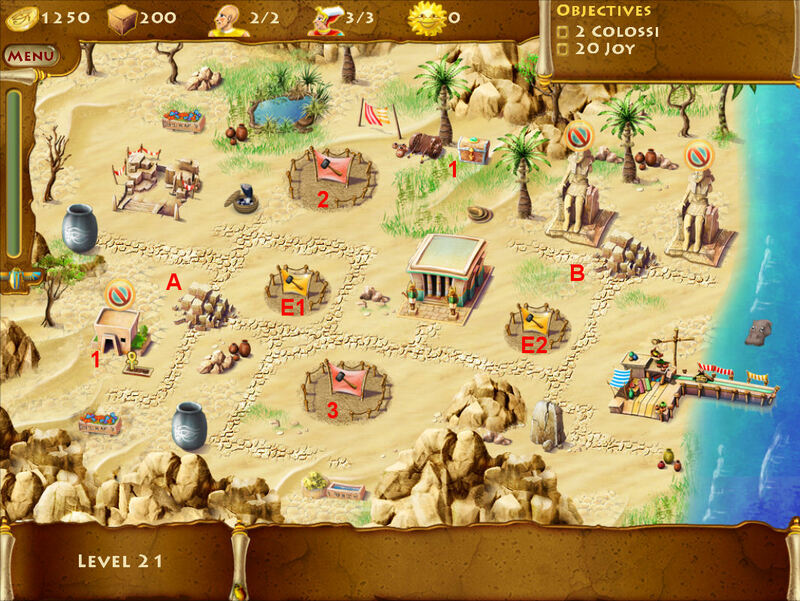 Pay off nomad 1 (500 gold) and open treasure chest 1 (1000 gold). Pay off nomad 2 (500 gold). Clear rockpile C, and build huts on Lots 2 & 3, upgrade twice. Continue collecting rent until you have 1500 gold and pay off nomad 2. Clear rockpile D then open treasure chest 2 (500 stone). 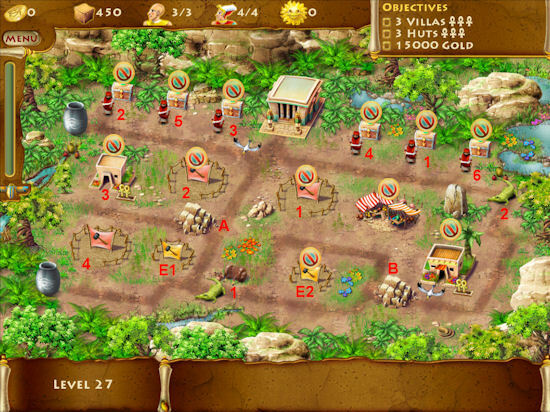 Upgrade huts 2 & 3 once and build a hut on Lot 5, upgrade 3 times. Collect rent until you have 1500 gold and pay off nomad 3. Open treasure chest 3 (1500 gold). Build a quarry on Lot 1 and clear rockpile E.
Build a hut on Lot 6 and quarry 50 stone. Upgrade hut 6 three times. Continue collecting rent until you have 4000 gold. Ignore the last nomad (the one with the X over him). A sphinx has fallen into disrepair and needs to be fixed. We also need to keep an eye out for robbers. When you see one (in a black robe), grab him and shake him briskly in order to collect his ill gotten goods. 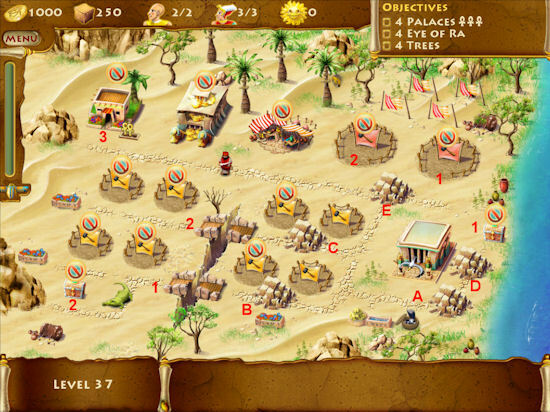 Collect rent and pay off nomad 1 (500 gold). 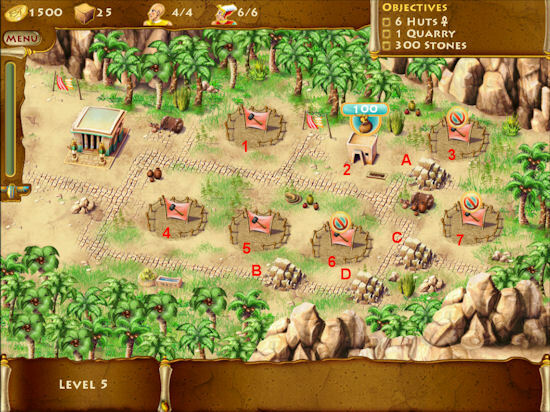 Clear rockpile A, upgrade hut 1 once, and build a hut on Lot 2. Clear rockpile B, upgrade hut 2 three times. Collect rent until you have 1000 gold and pay off nomad 2. Open treasure chest (300 stone). Assign 1 worker to the sphinx and hire a new worker. Assign a worker to the sphinx. Upgrade huts 3 & 4 once. Collect rent until you have 500 gold and hire your last worker, assign him to the sphinx. Keep an eye on your gold and stones and quarry 300 stone before the sphinx workers need it. You’ll need to quarry 300 stone twice in order to have enough (that’s three times total). A new port will allow you to trade with other countries. Keep an eye out for thieves! Open treasure chest 2 (200 gold) and upgrade hut 1. Build huts on Lots 2 & 3. Upgrade huts 2 & 3 twice. Assign one worker to the port. Upgrade huts 2 & 3 onced. Collect rent until you have 500 gold and hire a worker, assign him to the port. Build a statue at E3. Collect rent until you have 500 gold and hire a fourth worker, assign him to the port. Repeat twice until you have 5 workers assigned to the port and 1 to quarry stone. Collect rent until you have 1000 gold and quarry 300 stone, twice. Collect rent until you have 500 gold and quarry 125 stone. Level 14 adds a temple (aka a bank) and for each rent you collect the renter contributes half the rent amount to the local temple. So, if rent is 100 gold, the renter contributes another 50 gold on top of that to the temple. When you have a temple, keep an eye on your gold and how much is in the temple and withdraw the amount you need from the temple to do what you need to do. For example, to pay off the nomad, you need 2000 gold so once you have 1800 in gold, withdraw from the temple for the rest and pay off the nomad. Do the same for the quarry. Build fountain at E1 and open treasure chest 1 (75 stone). Upgrade hut 1 three times and build a hut on Lot 2 then upgrade it twice. Collect rent until you have about 1800 gold and there is at least 200 in the temple. 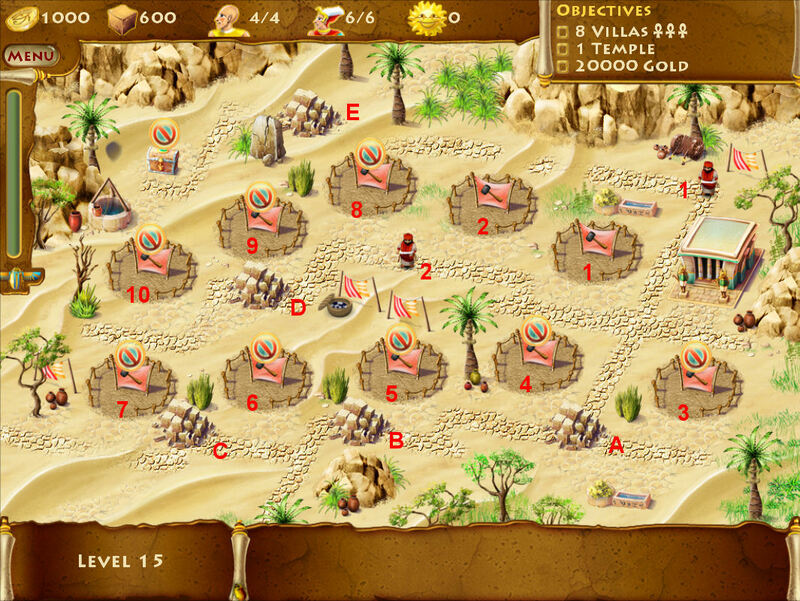 Withdraw from the temple and pay off the nomad (2000 gold). Clear rockpile A and upgrade hut 2 one more time. Collect rent until you have about 850 gold and at least 200 in the temple. Withdraw from the temple and quarry 300 stone. Continue collecting rent until you have about 2000 gold and 1000 in the temple. Withdraw from the temple. Level 15 adds villas to our cities. We’ll also need to build a temple. Clear rockpiles A, B, C, & D. You can do this in between building the villas and paying off the nomad. Build villas on Lots 2, 3, & 4 and upgrade once. 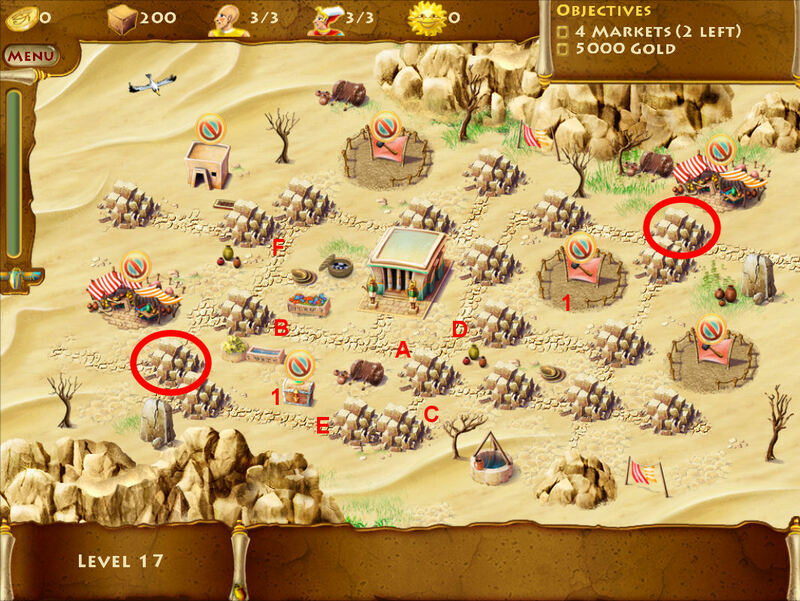 Collect two rents (250 gold each) until you have 1500 gold and pay off nomad 1 (top). Clear rockpile E then open treasure chest 1 (600 stone). Build temple on Lot 5 (500 stone). Upgrade villas 2 & 3 once. Collect rent until you have 1000 gold and build a quarry. Upgrade villas 2 & 3 once and villa 4 twice (you may need to quarry stone before the second upgrade). Build villa on Lot 6 and upgrade once. Collect rent until you have 5000 gold and pay off nomad 2. Clear rockpile D and build villas on Lots 7, 8, 9, and 10. Collect rent and quarry 300 stone until all villas have been upgraded 3 times. The last quarry will only need to be 125 stones so keep an eye on how many stones you have as you are upgrading the last villa. Each villa needs 375 stone to build and upgrade 3 times. Continue collecting rent and withdrawing from the temple until you have 20,000 gold. We now have a market where we can make deals. You’ll need to make deals with the merchant to get gold and stones so that you can build a quarry so you have more stones to bargain with. The more stones you have the better bargain you can get. If you don’t like the deal he offers, just wait until the next one. See what offers the merchant has and accept one if you like it. Keep checking out his deals as you play to get the best deals and the most money. The steps below assume you are doing this and collecting rent at the same time. Adjust the upgrades as needed based on the deals you get. Clear rockpiles D, E, & F.
Open treasure chest 1 (500 stone). Build villas on Lots 2 & 3 and upgrade both 2 times. Upgrade villas 2 & 3 one time. Once you have 2500 gold, pay off the nomad. Open treasure chest 2 (500 stone). Build villa on Lot 4 and upgrade 3 times. Upgrade villa 5 three times. Continue collecting rent and making market deals until you have 6000 gold. While there is a hut on level 17, it really isn’t very useful, so it’s up to you whether you want to upgrade it or not. 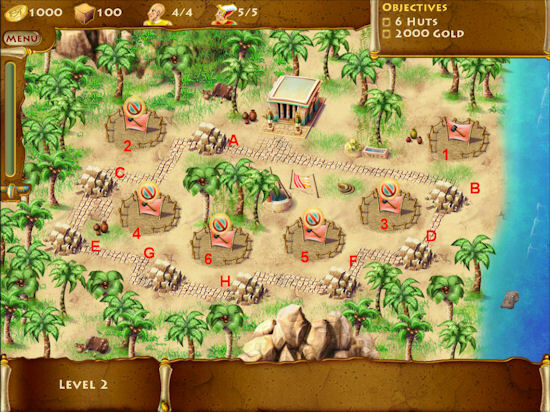 Clear rockpiles A, B, C, D, & E.
Open treasure chest 1 (1000 gold). Build quarry on Lot 1. Clear remaining rockpiles as they are opened up except for the ones immediately in front of the markets (circled in red). Try to clear the last two rockpiles at the same time and hopefully you’ll get a good deal from both of them. Wait until you have two workers in the shrine then select the top right market and send a worker there, then send a worker to the bottom left market since it is a tad closer to you. They should finish within a split second of each other. Quarry stone and get offers from the merchants until you have about 4800 gold and 1000 stone left. I only had to quarry stone 4 times. Build the last two markets. You may need to make one last deal (or three small ones) before you reach 5000 gold. 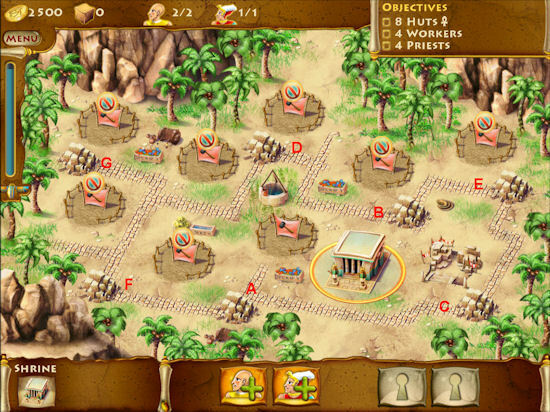 Level 18 has camel upgrades which help the workers carry more and work faster. That also means you’ll need more gold in order to quarry stone. Check out the market and take the highest offer the merchant makes. Once you have 1500 gold, pay off nomad 1. Open treasure chest 1 (400 stone). Clear rockpiles C, D, E, & F.
Upgrade the villa on Lot 1. 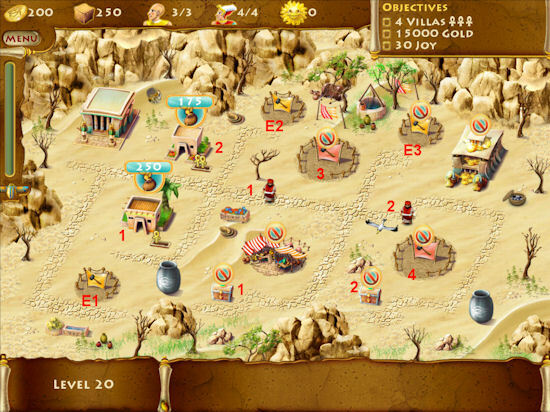 Continue trading at the market and start quarrying stone once you have enough gold. Build villas on Lots 2 & 3. Build statues on Lots E1 & E2. Once you have 2000 gold, upgrade to camels. Continue upgrading each villa as you can. When you have 3000 gold and all three villas upgraded, pay off nomad 2. Open treasure chest 3 (1000 stone). Build final villa on Lot 4 and upgrade 3 times. Continue quarrying stone until you have 4000 stone. Suggest you stop making trades at the market when you have at least 2500 stone and 2000 gold. Once you reach this point, quarry 800 stone twice and you should reach or exceed 4000 stone. On this level, ignore the nomad near the quarry. Build villas on Lots 1 & 2 and upgrade twice. Collect rent until you have 2500 gold and pay off nomad 1. Open treasure chest 1 (1200 stone). Build an obelisk on E1 and another on E2 once it is open. Upgrade villa 3 twice and villas 1 & 2 once. Assign 2 workers to Karnak. Build villa on Lot 4 and upgrade three times. If needed, quarry 300 stone in order to finish the last villa. Collect rent until you have 2000 gold and upgrade to camels. Continue collecting rent until you have 2000 gold and quarry 800 stone. Continue collecting rent and hire three workers as soon as you reach 500 (for each worker). Continue collecting rent and quarrying stone. Once Karnak is about halfway done, you should only need to quarry 800 stone twice more (or maybe three times, depending). On this level, the thieves have come up with a new disguise, as a camel, so keep any eye out. Of course, they’ll try to fool you by sending out thieves in all black too. Build a statue on E1. Collect rent until you have 1500 gold and pay off nomad 1. Open treasure chest 1 (300 stone). Do not trade at the market until he offers you 750 gold for 75 stone. Build a villa on Lot 3 and a statue on E2. Upgrade villa 1 until you run out of stone. Open treasure chest 2 (750 gold). Collect rent until you have 1000 gold and build a quarry on Lot 4. Collect rent and withdraw from the temple and quarry stone until both villas are upgraded. Build a statue on E3. Demolish the hut on Lot 2 and replace it with a villa. Upgrade the new villa three times. Make sure you have at least 2000 stone available and demolish the quarry. Build a villa on Lot 4 and upgrade it three times. Continue collecting rent and withdrawing from the temple until you have 15,000 gold. 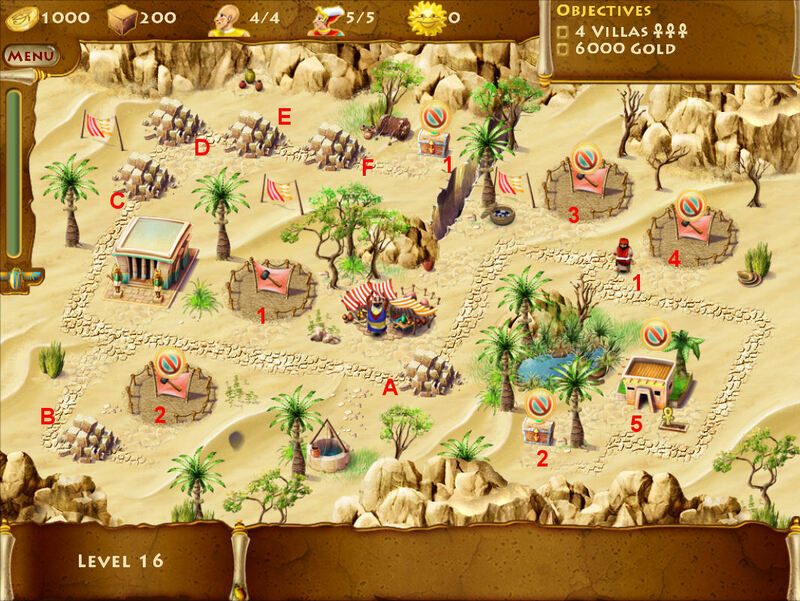 I had trouble getting gold on this one so after building the quarry, I saved up 2000 gold and upgraded to camels. Then I collected 2000 rent/withdrawals and quarried 800 stone and finished up my upgrades. I continued quarrying stone and trading it until I had 2000 stone then demolished the quarry and built my last villa and upgraded it. It wasn’t until I was able to get the large amounts of stone that I could finally get good offers and get gold. So, if you’re having trouble, try this instead. There are two Colussus statues to be repaired on this level. Although there is a port, it isn’t really needed and will just waste time and effort. Build a villa on Lot 2 and upgrade once. Upgrade hut on Lot 1 once. Build villa on Lot 3 and upgrade once. 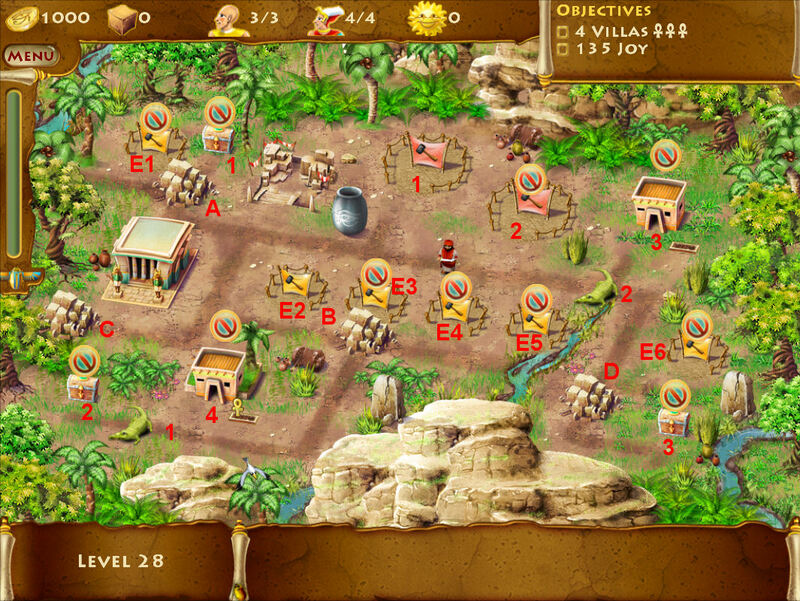 Continue collecting rent and quarrying 300 stone as you get 1000 gold. Build two fountains, one on E1 and one on E2. Assign one worker to a colussus. Continue collecting rent and hire two workers then assign them to the same colussus as the first worker. Continue collecting rent until you have 2000 gold and get the upgrade to camels (about halfway through completion of the first colusses). As soon as the first colussus is completed, move all three workers to the second colussus. Continue collecting rent and quarrying stone unti the second colusses is completed. If you have trouble reaching gold, try hiring one additional worker to start on the second colussus before the first one is completed. This is the last level before we cross the river. You can open the port if you want to but it can be completed to gold without it. Clear rockpiles A & B, then C.
Build a villa on Lot 2 and upgrade twice. Build a villa on Lot 3 and upgrade once. Collect rent until you have 2000 gold and pay off nomad 1 (on the left). Open treasure chest 2 (1000 gold). Upgrade the villas as possible while collecting rent and withdrawing from the temple (withdraw as soon as it gets to 1000 gold). Continue collecting rent until you have 1000 gold then quarry 300 stone. Finish upgrading the houses then send 2 of the workers to the pyramid. Continue collecting rent and withdrawing from the temple until you have 2000 gold then pay off nomad 2 (on the right). Continue collecting rent and withdrawing from the temple, quarrying stone and hire five workers as soon as you can afford them (500 gold each). Assign them all to the pyramid. Once you have hired all the workers (should have 8 total) and get another 2000 gold, upgrade to camels. Continue collecting rent, withdrawing from the temple, and quarrying stone. Keep an eye on the pyramid and once it gets about 3/4 of the way completed, stop quarrying stone when you have 1000 to 1200 available. You shouldn’t have to quarry more stone, but keep an eye out just in case. Make sure that if you need more stone, you get them in time for them to be used. An alternate method is to pay off the nomad on the right first so you can collect rent, but I prefer to pay the nomad on the left first so I can open the treasure chest to get enough to build the quarry and start collecting gold from the temple. I also like to hire all my workers as fast as possible and get them working on the pyramid. Once I get camels, it just goes faster but at least I’ve made a dent in the project already. On this level we’ll be building three totems to impress the natives with our friendly intentions. Open treasure chests 1 (200 stone) and 2 (500 gold). Build villa on Lot 2 and upgrade. Upgrade villa on Lot 3. Upgrade villas until you run out of stone. If either of the villas need upgrading, finish that first. Continue collecting rent until you can quarry 300 stone, twice. Repair the bridge (800 stone). Assign 1 worker to a totem. Clear rockpile C – don’t clear the one in front of the marketplace yet. Wait until you have enough stone to make it worthwhile. Open treasure chest 3 (300 stone). Upgrade the villa on Lot 4 three times. Assign 2 worker to the same totem as the first worker. As soon as you have 500 gold, hire a third worker and assign him to the same totem. Continue collecting rent until you can quarry 300 stone. Continue collecting rent until you have 2000 gold then upgrade to camels. Continue collecting rent and quarrying stone until you have about 2000 stone. Clear rockpile D in front of the marketplace. You should find a good offer for your. As each totem is completed, move all three workers to the next totem until all three are completed. Continue quarrying stone to make sure you get a good deal at the marketplace. For example, I had 1000 gold and 2000 stone and got an offer for 500 stone for 5000 gold … got my 6000 gold right there! 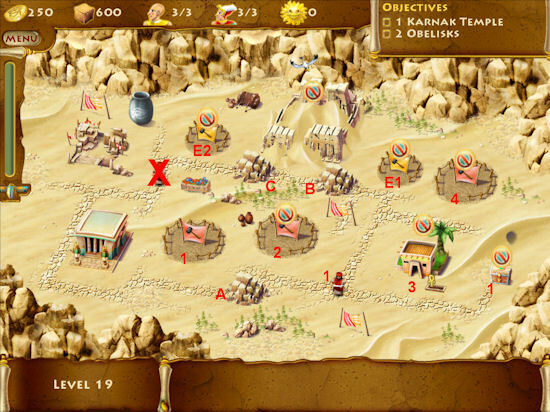 Unlike previous levels, you will need the port opened on this level. Build a villa on Lot 2. Pay off the nomad (1500 gold). Upgrade your villas and build a third villa on Lot 3, making sure you have at least 125 stone left. Collect rent until you have 1000 gold. You should get a trade for a camel – take it. If you don’t, you probably won’t see it later (I’ve never gotten it this way). Don’t upgrade or build on the villas. Collect rent until you have at least 1000 gold (and a bit more if possible). Hopefully you’ll get a trade for a camel – take it. Collect rent and withdraw gold from the temple until you have 2000 gold and can upgrade to camels. Continue collecting rent and withdrawing gold from the temple, quarrying gold and upgrading your villas. Build a villa on Lot 3 (if you followed camel upgrade #2) and upgrade three times. Build a statue on E1 (100 stone). Continue collecting rent, withdrawing gold from the temple, and quarrying until you have 1000 stone. Repeat until you have 2000 gold and repair Bridge B. Build a statue on E2 (100 stone). Continue collecting gold, trading, and quarrying stone until you have 3000 stones. Try to keep at least 2000 gold on hand in order to get awesome deals at the port for stone. 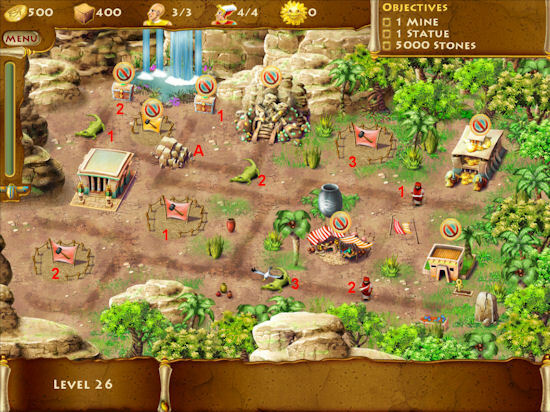 This level adds crocodiles which can only be scared away by camles – who spit on them until they can’t take it anymore. Open treasure chests 1 (200 stone) and 2 (750 gold). Open the port (1000 gold) and build two villas on Lots 1 & 2. Check out the offer at the port and hopefully you’ll get camels. If not, wait until the next offer. I didn’t get an offer until the third deal came up and then I had to quickly get some stone made to trade for the camel. I had barely come up with 1000 gold then from the rents (and still didn’t make gold). If you haven’t gotten the offer for the camel yet, save up 2000 gold and upgrade to camels. Scare off all the crocodiles (1, 2, & 3 first then 4 & 5). Open treasure chest 3 (500 stone). Hire at least one worker (500 gold). I ended up hiring two after I got the camel offer at the port. Build an obelisk and a statue on E1 and E2. 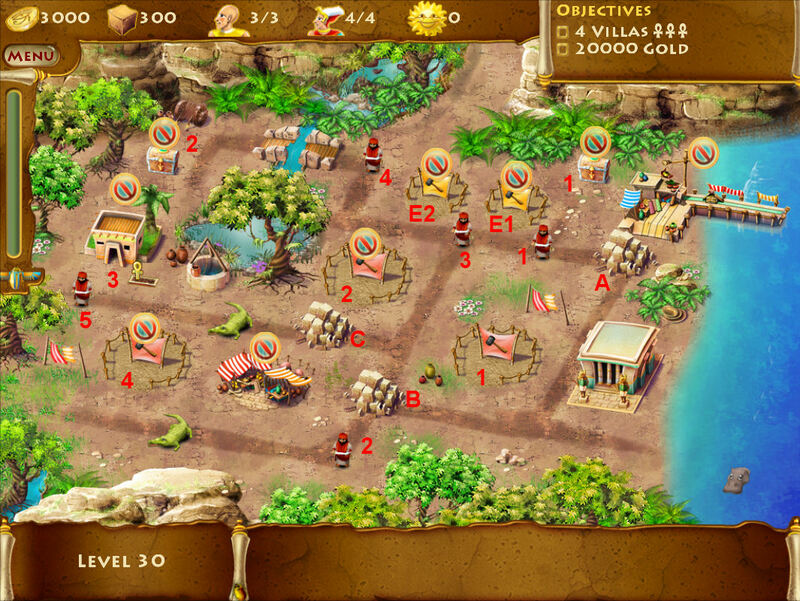 Continue gathering rent, quarrying stone, upgrading the villas, and making trades at the port (if they help you). 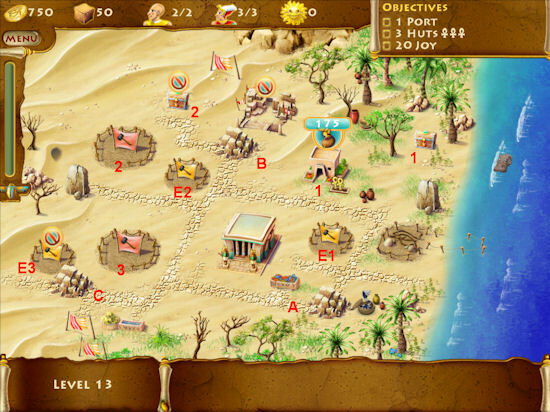 If you don’t get a camel offer on the first or even second deal at the port, then this level is extremely difficult to finish on time. If you have to upgrade the camels without a port deal, hire at least two workers (three if you can afford it) to help you get the upgrades done faster and keep up with the stone. If you get an offer for 1000 gold for 1000 stone, take it if you have enough gold. We have a mine deal with on this level, just to rebuild it fortunately. We don’t have to worry about actually mining anything. Clear rockpile 1 and open treasure chest 1 (750 gold). Build a villa on Lots 2 & 3. Upgrade each once. 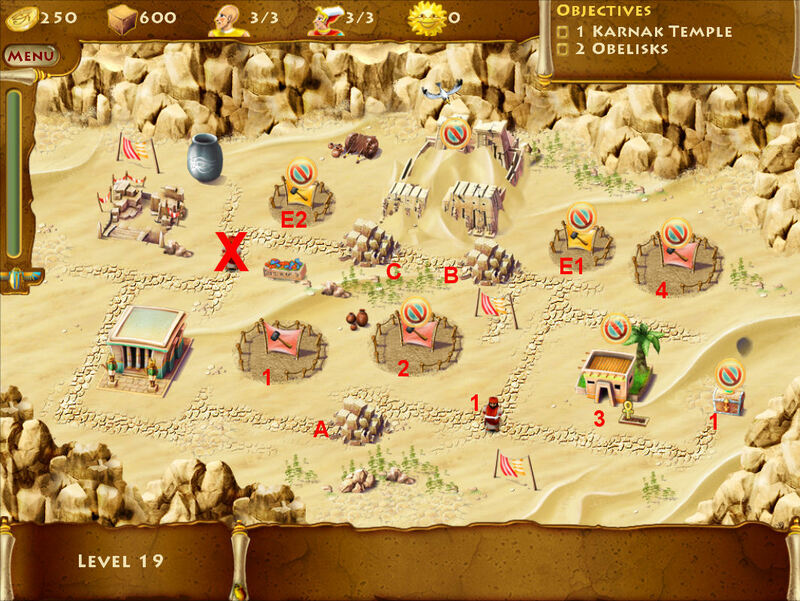 Continue collecting rent and withdrawing from the temple until you have 2000 gold then upgrade to camels. 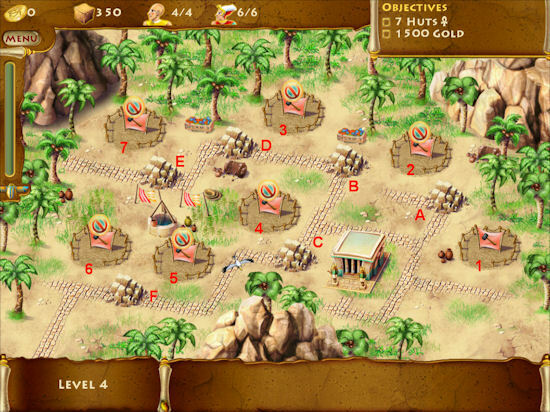 Chase off crocodile 1 and open treasure chest 1 (600 stone). Chase off crocodile 3. Don’t chase off crocodile 3 until after you’ve opened the chest 2 so you’ll get a better opening deal at the market. Continue upgrading your villas as you are able. Make a deal at the market for the highest amount possible. Assign a worker to the mine. When you have 1000 gold, pay off nomad 2. Upgrade the last villa twice. Hire a fourth worker and assign him to the mine. As you get 500 gold from rents, hire a fifth worker and assign him to the mine. You’ll have four on the mine and one to quarry. I hired a sixth worker so that as soon as one worker left the quarry, I hit the 800 stone button and the next worker could start quarrying. I was barely missing gold several times until I hit on this method. Remember to collect money from the temple as soon as it hits 1000 gold as well as rent in order to get gold faster. Be careful near the end of the level when making deals at the port that require you to trade your stone. Unless it is for a small number of stone and a huge gold payout that will help you make more stone because the rents aren’t coming in fast enough. As with other levels, arresting thieves helps you build up your gold levels and here they’ll help you pay off the nomads. Grab thieves until you have 450 gold and pay off nomads 1 & 2 (150 & 300 gold). Open treasure chests 1 (100 stone) and 2 (600 gold). Build villas on Lots 2 & 4 and upgrade once. Gather rent and grab thieves and pay off nomads 3 (500 gold), 4 (800 gold), 5 (1000 gold), & 6 (1200 gold) – in that order. 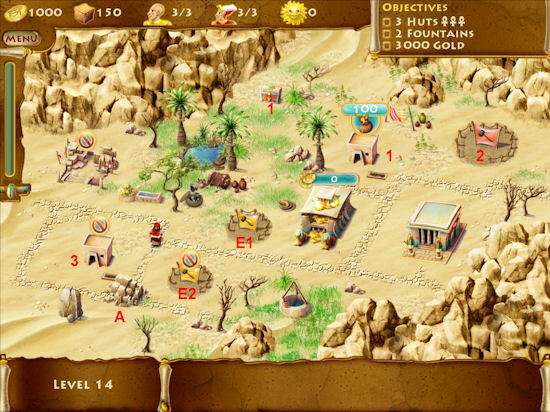 As you pay off the nomad in front of it, open treasure chest 3 (200 stone), 4 (1000 gold), 5 (300 stone), and 6 (500 stone). Scare off crocodiles 1 and 2. Build a hut on Lot 1. Upgrade your villas and huts as fast as possible. You can do a a deal with the merchant if you want but then you’ll need to demolish the market. Build a hut on the now vacant lot and upgrade it three times. Use any leftover stone to build a statue and/or obelisk. Don’t build the joy items until after you have built and upgraded all huts and villas so you can see what you can afford to use on them. Continue collecting rent until you reach 15,000 gold. This level adds a censer and a tree to our joy items. We’ll need to build 5 censers and a statue in order to reach 135 joy. Open treasure chest 1 (1000 stone). Build a villa on Lot 1 and upgrade. Build a censer on E2. Upgrade villas as much as you can. Once you get 2000 gold, upgrade to camels. Open treasure chest 2 (1000 g). Collect rent until you have 2500 gold and pay off nomad. Upgrade villas that still need any. Build a villa on Lot 2 and upgrade three times. Upgrade villa 3 three times. Quarry stone as soon as you get 2000 gold and continue doing so until all villas are upgraded and joy items built. Work fast and multi-task. We also have access to elephants here which increases how fast the workers build and how much they can carry. Trade the merchant for his highest deal. Upgrade villa as soon as you’ve made a good deal with the merchant. As soon as you have 1500 gold, pay off the nomad. Keep collecting rent, quarrying stone, and trading with the merchant until you can build a villa on Lot 2 and upgrade as soon as possible. Build a tree on E1 (350 stone). 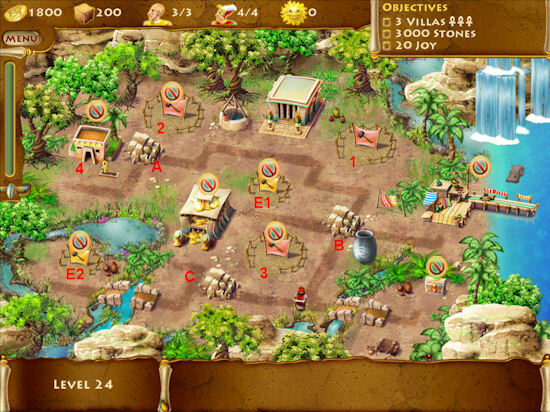 Continue quarrying stone and making trades (use stone to build immediately after a trade in order to get the best deals) until you have 4000 gold then upgrade to elephants. As soon as you have 2000 stone, repair the bridge. Demolish the hut and build a villa, upgrade three times. Build an obelisk (minimum) on E2 (200 stone). Quarry stone and make trades until you have between 8500 and 9000 stone. Make one last trade with the merchant for 5000 gold then demolish the market. Build your last villa on the now vacant lot and upgrade three times. Quarry stone until you have 10,000 stone. If you have trouble with this one following the steps above, try building censers on both E1 & E2 and demolishing the hut sooner. This level totally depends on when you can get elephants and what offers you get. I could not get gold with elephants but finally got 6:20 with camels and eventually, after about 15 times, got 5:20 with camels. First, I’ll give you the method that worked for cstdenis, then the method that worked for me. Pay off nomad 1 (1000 gold). Open treasure chest 1 (). Make a trade at the port. If you don’t get a camel or elephant on the first trade take what they offer (unless its for a worker or priest). Build a villa on Lot 2 and upgrade at least once, three times if possible. Build a tree on E1. 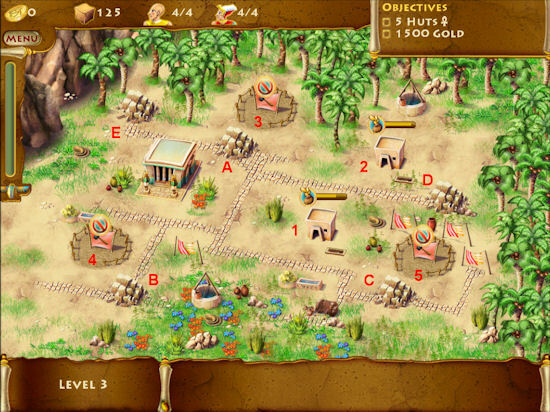 Pay off nomad 2 (1000 gold) and start trading with the merchant. Build a quarry (1000 gold) and start quarrying stone and trading it with the merchant and port. If an offer comes in at the port for elephants or camels, take it if you can. If you’re a bit short, see if you can quarry stone or make a trade with the merchant fast enough to make the deal at the port. If not, save up 2000 gold at least and upgrade to the camels – unless you really want the elephants, then you’ll need 4000 gold. As soon as you get the camels or elephants, scare off the crocodiles. Demolish the market and build a villa on the now vacant lot, upgrade 3 times. Build a villa on Lot 4 and start upgrading. As soon as you can, pay off nomads 3 (500 gold) and 4 (1000 gold). Open the treasure chest (2000 stone). Pay off nomad 4 (3000 gold) and upgrade the villa on Lot 3 twice. If possible, add a second joy item to E2. Continue collecting rent and trading at the port until you get 20,000 gold. As soon as you have 1000 gold, pay off nomad 2. Start making trades at the market for the highest amounts. Make trades at the port. As soon as they offer a camel or elephant, take it. If you can’t get a camel or elephant deal quickly, save up 2000 gold and upgrade to camels. As soon as you have the camels or elephants, scare off both crocodiles. Build a quarry and start quarrying stone. Build a villa on Lot 4 and upgrade three times. As soon as you have 3000 gold, pay off nomad 5. Upgrade the villa on Lot 3 twice. Pay off nomad 3 (500 gold). As soon as you have 1000 gold, pay off nomad 4. As soon as you have 800 stone, repair the bridge. Open treasure chest 2 (2000 stone). Once you have about 4000 stone, demolish the market. Build a villa on the now vacant lot and upgrade three times. Add a statue on E2. Continue making deals at the market and collecting rent until you have 20,000 gold. This level can be finished a lot easier than the last one, but it will be close! I finished at 5:28. 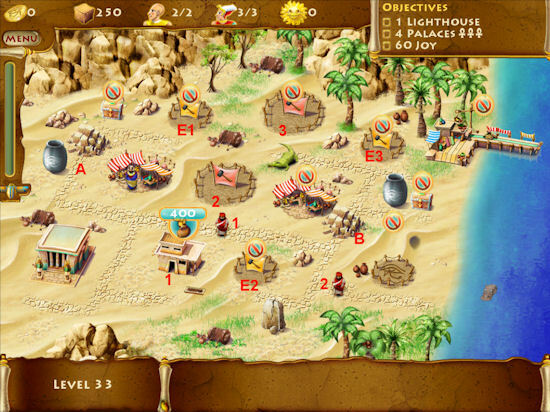 Clear rockpiles A, B, then C.
Upgrade the villa on Lot 2 once, then build villas on Lots 3 & 5, upgrade each one twice, if you have enough stone. 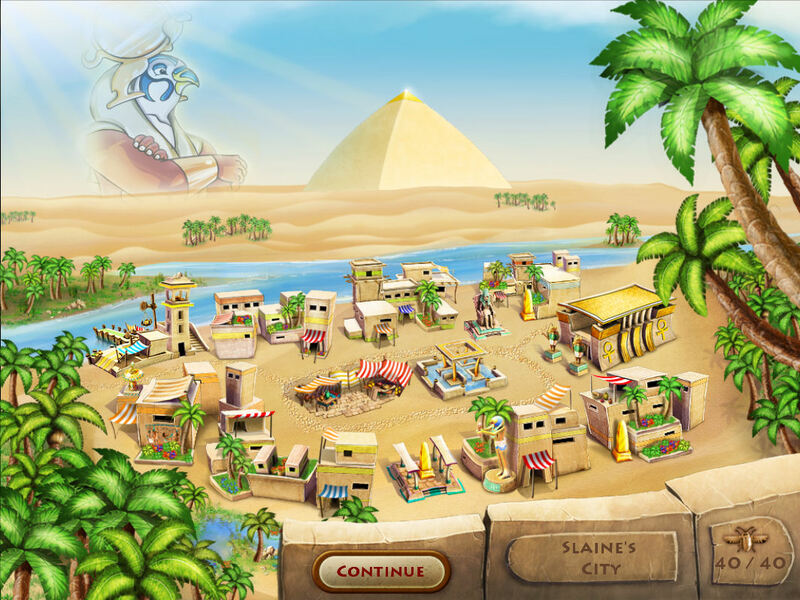 Collect rent until you have 2000 stone and upgrade to camels. Scare off crocodiles 1 & 2. Open treasure chest 2 (1000 stone). Build censers on E1 & E2. Collect rent until you have 2000 gold and pay off nomad 1. Collect rent until you have 2000 gold and pay off nomad 2. Collect rent until you can quarry stone and as soon as you can, finish upgrading villas then build a villa on Lot 4 and upgrade immediately. Upgrade the villa on Lot 6 once. Build censers on E3, E4, & E5. As soon as all villas and most censers are built and upgraded, demolish the temple. Try to have enough stone available for it. 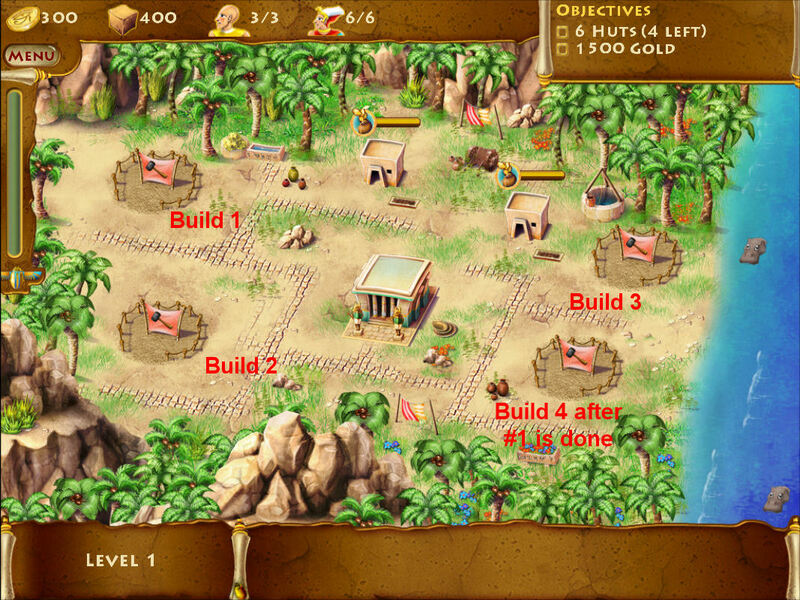 Demolish the temple and build a villa on the lot before the timer goes red and starts ticking. We have a crocodile temple to build on this level and will need x workers assigned to it. You can start out with camels but eventually you will have to switch to elephants, so it is up to you if you want to start out low and work up or start out with elephants and be done with it. I started with camels and then upgraded later to elephants and finished in 5:46. And this was without opening the port. I found that when I opened the port, the deals were useless, like a new priest instead of somthing useful like a worker or elephant. Build villas on Lots 1 & 2. Upgrade 2 of the villas once. Open treasure chests 1 (1000 gold) and 2 (500 stone). 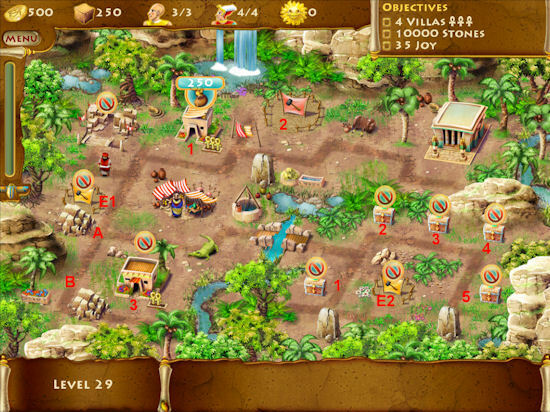 Hire at least one worker and assign two workers to the crocodile temple. As you collect rent, quarry stone and upgrade your villas. As you can, hire three more workers and assign them to the crocodile temple (will need 5 total). Make sure you have two workers available until all villas are upgraded and the last tree built, then assign the last worker to the temple, leaving you one to quarry. Build a villa on Lot 4 and upgrade. As soon as you have 4000 gold, upgrade to elephants. If you don’t do it soon enough, the workers will quit until you have elephants to complete the task. Build a tree on E2. Collect rent and quarry stone until the temple is almost done. On this level we need to build a lighthouse and there’s a new house available, a palace. Open treasure chest 1 (750 stone). Trade with the merchant for the highest amount (500). Collect rent from the palace then upgrade once. Once you have 1000 gold, build a quarry on Lot 2. Begin quarrying stone and add a tree on E1 as soon as you can. 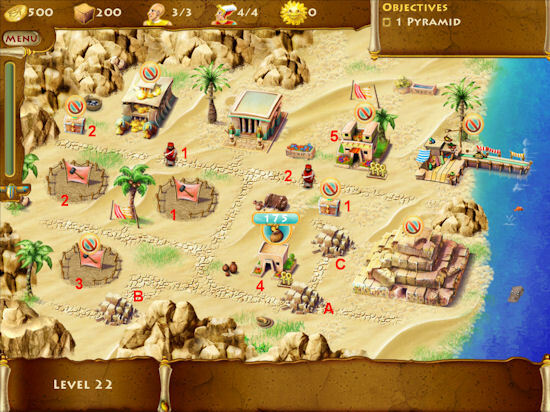 As soon as you have 4000 gold, pay off nomad 1 and begin trading with the second merchant. Open treasure chest 2 (750 stone). Keep quarrying stone and trading until you have 4000 gold, then upgrade to elephants. Build trees on E2 & E3 as you can. Pay off nomad 2 (3000 gold). Hire three workers and assign them to the lighthouse. Build a palace on Lot 3 and upgrade three times. Trade and quarry stone as fast as you can. Once you have enough gold to hold you over for quarrying stone (I had 10,000 gold at this point). Demolish both markets and build palaces on the now empty lots. Continue quarrying stones until the lighthouse is almost complete. There are 9 nomads to pay off at 3000 gold each, all while trying to get 20,000 gold for the goals. If you can, don’t pay off the nomad by the villa (nomad 1) as the amount you get from the villa doesn’t make it that worthwhile. Keep an eye on the port offers and make sure you use them wisely. For example, I once got an offer for 500 stone for 15,000 gold. Instead of keeping it and just gathering rent from the palaces and paying off the nomads in front of the joy spots, I paid off all the nomads without thinking. Needless to say, I did not make gold that time. 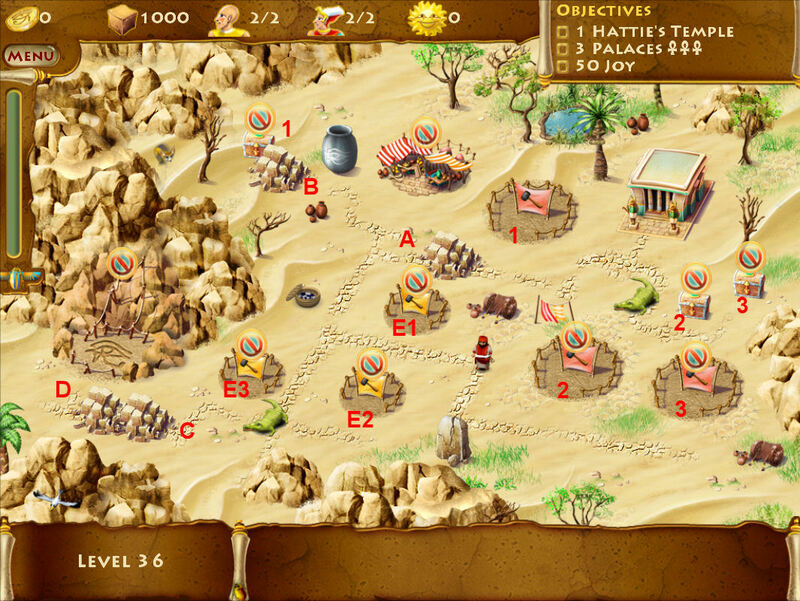 Pay off nomads 3 and 7 (in front of chests) and 5 (in front of palace at top right). Open treasure chests 1 (1500 stone) and 2 (500 stone). Upgrade both palaces all the way. Hopefully you’ll get the camels or elephants from the port right off, but if not, at least save up and upgrade to the camels. Pay off nomad 4 (joy spot by water). Pay off nomad 9 (by temple). Pay off nomad 6 (by quarry). Begin quarrying stone as you can so you can get offers from the port. Pay off nomads 2 & 8 (by joy spots on left). Build censers on E1 & E3. Pay off nomad 1 if you have to. Continue collecting rent, withdrawing from the temple, and trading at the port until you get 20,000 gold and 2000 stone. The key to this level is making a lot of trades at the market and not worrying about getting across the other bridges until further into the level. There are three places where I differed from the steps provided on the forum and I’ve added them in parenthesis. If you want to wait to do those items, just keep following the steps until you get to the items again. I finished in 6:58 doing it my way. Clear rockpiles A, B, C, & D.
Build bridge 1 (400 stone) and trade at the market for the highest offer (should be 75 stone for 750 gold). Open treasure chest 1 (600 gold). Pay off nomad (1500 gold). Clear rockpiles E & F.
Collect rent but do not upgrade yet. Build the quarry on Lot 1 and quarry stone as fast as you can. 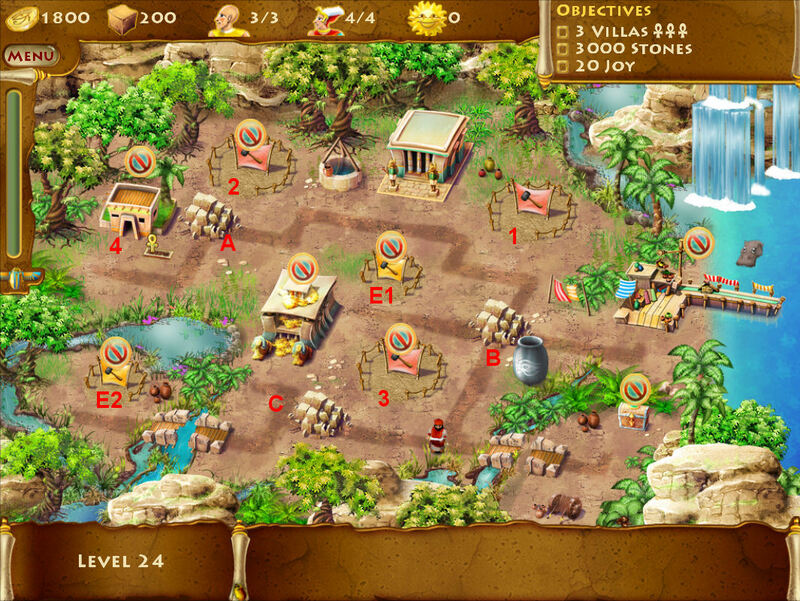 Continue trading at the market and quarrying stone until you have 4000 gold then upgrade to elephants. Build bridge 2 (800 stone). Keep trading at the market and quarrying stone. Now it is time to really hustle! Build bridge 3 (1200 stone). Break rockpiles H & I. Build a palace on Lot 4 and immediately upgrade three times. Don’t let the worker leave the lot! Open treasure chest 4 (500 stone). Upgrade the palace on Lot 2 two times if you didn’t do it earlier. Demolish the villa on Lot 3 if you didn’t do it earlier and build a palace on the now vacant lot. Immediately upgrade three times. Demolish the market then build a palace on the now vacant lot and upgrade 3 times. Keep quarrying stone until you have 5000 stone. On this level, you can pay off the nomad first or get the elephants first. I paid off the nomad first and built palaces so I could start collecting rent. Make a deal at the market. Start making stone and then trade at the market. As soon as you have 4000 stone, pay off the nomad. Build palaces on Lots 2 & 3 and upgrade as soon as possible. Continue quarrying stone and making deals at the market. As soon as you have 4000 gold, upgrade to elephants. Open treasure chests 2 (1000 stone) & 3 (1000 gold). Continue quarrying stone, making deals at the market, and finishing up any upgrades on the palaces. As soon as you can assign a worker to the temple and start hiring more, assigning each to the temple until you have 5 working on it. I like to have 2 workers in reserve to keep up with the quarrying demand, so I had a total of 7 workers. Hire at least 2 priests to keep up with the rent and market deals. Build obelisks on E2 & E3 as soon as you can. Continue quarrying as fast as you can and making trades at the market. Once you have enough stone to complete the temple and still have time (I had about 3500 stone and the temple was about 3/4 done and the timer was about 30 seconds from starting to tick down), tear down the market and build a palace on the now vacant lot. Immediately upgrade 3 times. Keep an eye on your stone to make sure you have enough and quarry more if you have to. 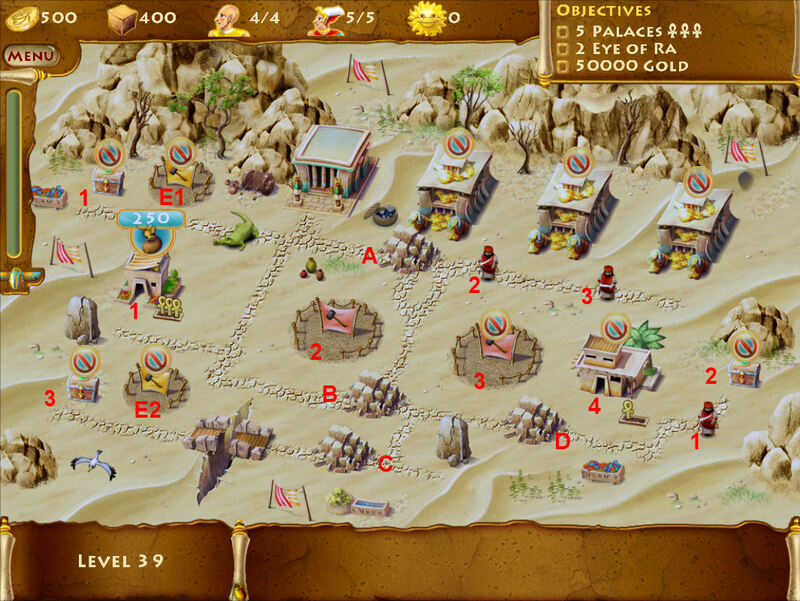 This level introduces the Eye of Ra as a new embellishment. 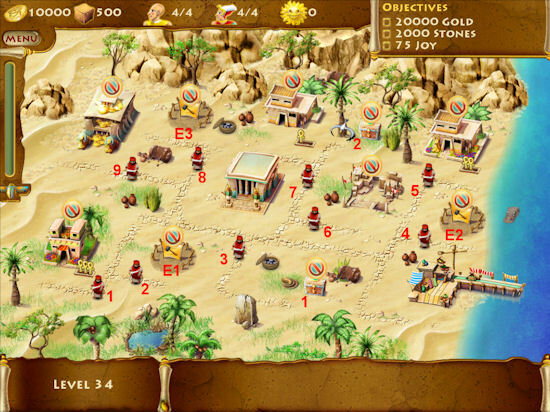 The key to this level is keeping your stone levels up so you get good deals at the market while demolishing the temple, villa, and finally the market in enough time to get the best deals while getting enough rent so you can quarry enough stone for the Eye’s of Ra. This is one of the few levels where I’d recommend skipping a bad deal at the market and quarrying stone so the next deal is better. You can hire a worker right off the bat, but I don’t recommend it. I found that waiting worked better for me. Build a palace on Lot 2 and upgrade it as fast as possible. Collect rent and quarry stone as you can in between upgrading. It’s actually bettter to miss a rent than miss an upgrade here. If you don’t have enough stone and can’t get a good deal at the market, don’t take it. It’s better on this level to quarry stone so you can get a huge deal in a few moments. Try to make deals at the market before you build or upgrade, but don’t wait too long especially if the deal timer isn’t near the end. Better to build and skip a deal than lose the time building. As soon as you have 350 stone, build a tree on one of the joy spots. Continue collecting rent, quarrying stone, and making deals at the market. As soon as you can, hire two more workers. Have at least one worker hired before you pay off the nomad so you can quickly build the remaining palaces while building joy items as well. I ended up with six workers to build as many joy items as I could at the same time. As soon as you have 3000 gold, pay off the nomad. Immediately demolish the villa at the end. Build a palace on the now vacant lot and begin upgrading it. Collect rent from the palace, withdraw 1000 gold from the temple, and immediately demolish it. You don’t have enough palaces available to make keeping it worthwhile. Build a palace on the now vacant lot and upgrade it as fast as possible. Once you have 4000 gold, upgrade to elephants. As soon as you have 2000 gold, repair bridge 1. 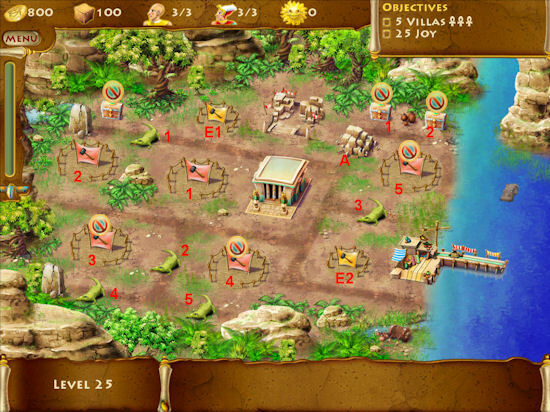 Scare off the crocodile and open treasure chest 2 (1500 stone). Hire at least one more worker, two if possible. Build trees on the remaining two spots on the right of the bridges. If you have time, make one last great deal at the market then demolish it and build a palace on the now vacant lot. If you can, make sure you have a good number of stone available, like 3000 before the deal timer runs out so you get a good deal first. As soon as you have 4000 stone, repair bridge 2. As soon as you get 1000 stone for each one, build an Eye of Ra on the remaing 4 joy spots. This level starts you out with 8000 gold but no workers and no priests. Open treasure chests 1 (1000 gold), 2 (1000 gold), and 3 (500 stone). Clear rockpiles D & E.
Build palaces on Lots 2 & 3. Upgrade as much as possible. Hire a worker and 2 priests as you can. Build an obelisk (200 stone) on E1 or E2 to get the rent to come in faster. Build 2 villas on Lots 4 & 5 and upgrade as you can. Build a hut on Lot 6 and upgrade all the way, even if the other buildings aren’t fully upgraded. Don’t worry about collecting rent from the hut, it’s not worth it. If you see hourglasses show up when collecting rent, hire more priests. When you have at least 600 stone and all buildings are upgraded, demolish the quarry, build a hut on the now vacant lot and upgrade 3 times. 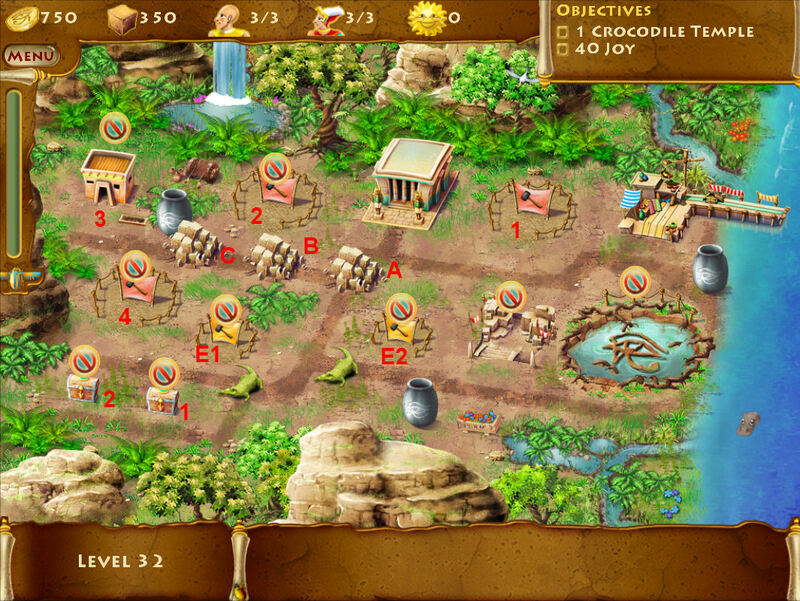 On this level, you have three temples and you’ll need to demolist one of them in order to build one of the palaces. Don’t demolish the other two as you’ll need them to get the 50,000 gold. Build a palace on Lot 2 and upgrade as you can. As soon as you have 2000 gold, upgrade to camels. Continue collecting rent until you have 4000 gold then pay off nomad 1. Open treasure chest 2 (2500 stone). Build a palace on Lot 3. Build an Eye of Ra on E1. Use any remaining stone to upgrade the palaces as much as you can. Demolish the hut and build a quarry. Continue collecting rent and withdrawing from the temple while upgrading the palaces. As soon as you get 4000 gold, upgrade to elephants. As soon as you have 4000 gold, pay off nomad 2. As soon as you have 4000 gold, pay off nomad 3. As soon as you have 8000 stone, repair the bridge. Open treasure chest 3 (5000 gold). Build an Eye of Ra on E2. If you need to, hire another priest or two to keep up with the rent and withdrawing from the temples. Demolish the temple closest to the shrine and build a palace on the now vacant lot. Immediately upgrade three times. When you have at least 2000 stone, demolish the quarry and build a palace on the now vacant lot. Immediately upgrade three times. Hire priests as you need them. It’s better to have one or two extra than to not have enough. 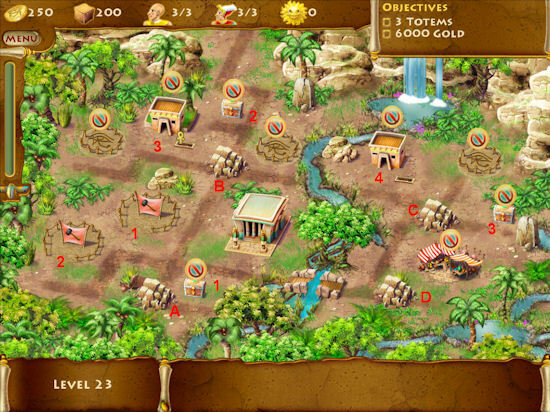 Continue collecting rent and withdrawing from the temples until you have 50,000 gold. Keep up with the temples especially since you don’t want the amount there to get too high since you can only withdraw 1000 gold at a time. This is our final level where we either build a great pyramid or bring down the wrath of Ra. Clear rockpiles A, B, C & D.
Clear rockpile E at least three of the other rockpiles have been cleared. Scare off all three crocodiles. Build a market on Lot 2. Upgrade the palace as soon as you can. Continue quarrying stone so you can keep it above 2000 and get trades for 5000 gold at each market. As soon as you have 2500 gold, pay off nomad 1. Open treasure chest 2 (1500 stone). As soon as you havd 4000 gold, pay off nomad 2. Build a tree on E1 (350 stone). Don’t know if this helps, but adding joy seemed to make the difference between my finishing at 7:24 and not 8:45. Add workers as fast as you can. You’ll need 12 all total. Start assigning them to the pyramid. I started assigning them once the timer got to the red mark I added on the timer. Finish hiring workers and assigning them to the pyramid. Hire at least one priest to keep up with the market and rent. If you want, build another joy item on E2. I added a censer (500 stone). Again, not sure if this helped, but I’m convinced it did for me! Build a market on Lot 3. 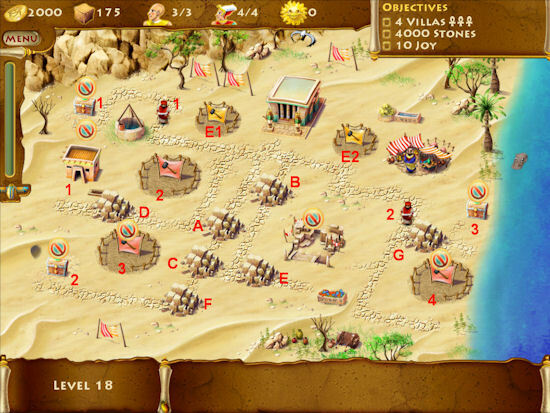 Continue quarrying stone and making deals until you have at least 5000 stone and 10,000 gold. Stop making stone unless it starts to get under 2000. When the pyramid is finished and the dialog pops up, click on Skip All and immediately reassign the 11 elephants back to the pyramid. Hopefully, you’ll reach this point at about the time the timer gets to the blue mark I made on the timer, which is about at the top of the tripod on the well. I found that if I started the gilding later than this, I couldn’t make gold. The first part of the gilding goes very fast but the last 30-45 seconds just seem to crawl. Once the gilding starts, you shouldn’t have to make any more trades at the markets. Just sit back and let the biting of nails commence.